The implementation of the Peace Accord with the FARC provides an opportunity to advance peace, human rights and gender equality through key structural changes in Colombia. What are the new challenges and obstacles facing Colombia following the 2018 elections? What progress has been made on the implementation of the gender-inclusive peace agreements? 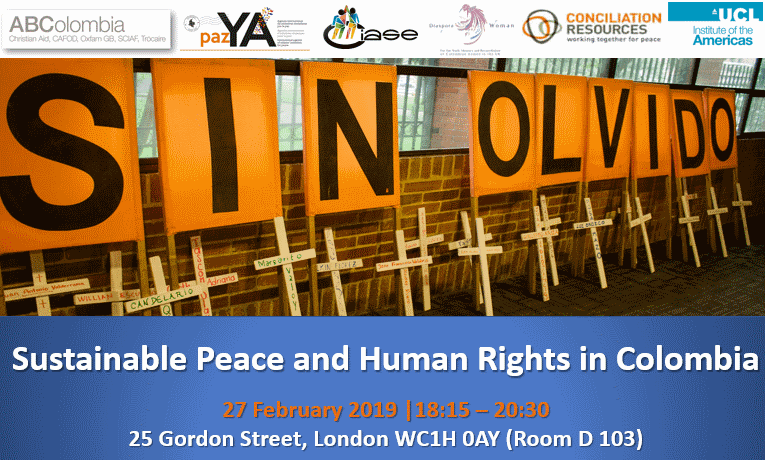 On 27 February, Prof. Maxine Molyneux discussed these questions with Colombian Human Rights Defender Rosa Emilia Salamanca (Corporation for Research, Social and Economic Action – CIASE), Myriam Ojeda (Initiatives for Peace) and Louise Winstanley (ABColombia). Download the event flyer here. ABColombia launched its new report on the implementation of the gendered agreements in the Colombian Peace Accord. The event included a screening of a short documentary about families of victims of forced disappearance in Colombia, and a presentation by Elizabeth Santander from the European Group of Family Members of Victims of Disappearance in Colombia.